(CNN) – Louisiana Republican Gov. Bobby Jindal said Thursday he's against Common Core, the academic standards that have many conservatives decrying the program as an overreach of the federal government. "I'm against the Common Core, and I don't want Louisiana to be in the Common Core,” he said to booming applause at the Republican Leadership Conference - the annual conservative confab, held this year in New Orleans. 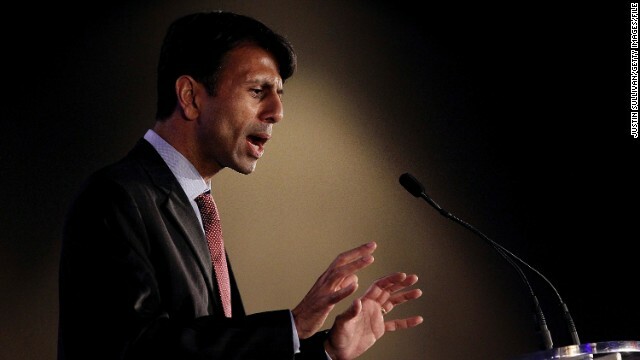 Jindal is term-limited as Louisiana governor and is considering launching a bid for the GOP presidential nomination in 2016. He's was the first in a series of conservative White House hopefuls to speak at the conference. Jindal was once for Common Core but recently has said he wants Louisiana, which adopted the standards in 2010, not to participate. "We've taken a lot of criticism in this state from folks that have criticized me for being against it," Jindal said Thursday. "Let me be very clear, I'm for standards and I'm for our kids learning and our kids being able to compete but it seems to me that there is something fundamentally wrong when the bureaucrats, when the federal government especially, thinks they know best and they don't need to listen to parents." Jindal continued in that vein, tying the fight against unified education standards to a broader argument against an overbearing federal government. "On the left you've got this group that thinks we're not smart enough to buy our own health insurance; we're not smart enough to select our own schools for our children, we're not smart enough; by the way, to exercise our Second Amendment rights; we're not smart enough to decide what size soda we should be drinking, apparently." Another potential 2016 presidential candidate, former Florida Gov. Jeb Bush, supports Common Core. He argues the standards help prepare students for college and the workforce. New Jersey Gov. Chris Christie, another GOP possible White House contender, is also in favor of the standards, which apply to students in kindergarten through 12th grade in the subjects of language arts/literacy and math. His speech followed Reince Priebus, the Republican National Committee chairman, whose address to the conservative confab kicked off the New Orleans conference. Texas’ Gov. Rick Perry and Sen. Ted Cruz are slated to address the conservative crowd. Notable, however, are the potential 2016-ers who are not attending this year’s confab - New Jersey Gov. Chris Christie, Sen. Marco Rubio of Florida and Sen. Rand Paul of Kentucky. they where for before they where against. what a crock. what has the repo party done for this country and it's people lately??? ol man Mc Caine calling for resignation of Va guy. It's Mc Cains state wasnt he watching??? 0bama and the dems have put us back a 100 years from the space above we like to explore to the race below as they have decern human beings . What a example for our children . So we're now to the point where anything the government does... even things that have been done forever, or could help society a lot.. or have mainly been government's portfolio... is now always going to countered by the GOP/Conservatives as "DON"T TELL ME WHAT TO DO OPPRESIVE GOVERNMENT AUTHORITIES!!! I'M A GROWN PERSON AND WILL MAKE MY OWN DECISIONS EVEN THOUGH I AGREE WITH WHAT YOUR SAYING MORE OR LESS!!!" Sounds like a 4 year old with ego problems and anger issues. No wonder the USA is falling behind. Half its population is living in a fantasy world where they think Governments and Nations somehow recently began trying to have input on their lives. News flash. Government at all levels and authority has always done this from a lowly stop sign to a criminal trials to yes, regulation of things like food and education. Once you start opposing things generally accepted as good ideas only because your Gov (authority figures) proposed them, then you got problems. Especially when whatever they proposed hasn't and probably never will be done without some sort of regulation. "Another potential 2016 presidential candidate, former Florida Gov. Jeb Bush, supports Common Core. He argues the standards help prepare students for college..."
The only thing Common Core math prepares people for is counting on their fingers. It's dumbed-down drivel, the apparent purpose of which is to further the Left's goal of equality-of-results by aiming the math so low that even people who can't even reliably count past ten can "succeed." With Common Core math, there's basically no way even to get to trigonometry, let alone limits, calculus, statistics, or anything that requires dealing with the abstract rather than the concrete. It sure doesn't prepare you for any kind of science or engineering programme. He does know that the common core was developed without the federal government, correct? Of course he doesn't want kids educated. Ignorant folks are easier to con into TEA/GOP lies. Jindal needs to shut his mouth and believe in the Obama-nation. Stop thinking and let the Government think for you. The idea of personal freedom and choice that was once guaranteed in the Constitution is outdated! Obama knows what you need. We'll just pay for it on the Chinese Express Credit Card. So surrender you free will. Believe in the Obama-nation. This guy is a tool. A red-meat thrower. Has he ever offered a single constructive, positive idea? There is something so strangely wrong with Louisiana Republican Gov. Bobby Jindal . Very out of touch with reality , the guy believes in an old world cast system mixed between a Baptist Krishna and a southern bubba . Louisana' s public school system is ranked almost last in the country.What if anything are the standards that Gov Jindal speaks of? It appears he is against any idea that did not originate in a church or conservative thin tank. Bloomberg is a repug for starters. And, Mr. Mardi Gras, yes, you are correct your party and your followers who keep voting against their own good are NOT smart enough. As far as learning . . . . . . science is out as our some of our founding fathers and in Texas, where the books are printed are on their way of doing it if they have not already done so. The list of presidential candidates is still a joke. Keep piling them into the clown car. --this man talks just absurd. I don't know how this man even qualifies for the presidency. Every one is not a fool to put him in a backward state like LA. None of the republican trash is worth my time, your time either. Federal government never said parent involvement is unnecessary. Talk like an idiot. Simple. Is this what the American people want to here from Republicans? I don't like it but i do not have an altarnative these people are who voters want to lead them? if the American people do not reject the gop in november we will suffer. Conservatives just want to have something new to complain about. Common Core defines a *minimum* standard of excellence for public schools. State and local governments should be broadening that foundation, and building upon it. Most government regulations function in the exact manner. From building codes to health codes, from environmental regulations to work safety regulations, federal laws define a *minimum* standard of excellence: i.e. minimum wage. What's really going on is that we have have a bunch anti-science, right wing extremists who do not want certain subjects taught in their public schools. To them I say, send your kids to a private school or home school them because you're imposing your narrow views on the majority of people who do believe in science. Public schools are not religious schools to be used to indoctrinate your community with your narrow beliefs. If not Common Core, than what set of standards will the GOP accept? They have been screaming for the need for some sort of national standards for years, yet, when presented with the standards and the pushback regarding government overreach from people content to have our country languishing far behind other countries, they fold like moths on a furnace. The fact that the Right is unwilling or unable to come up with any sort of alternative, and instead mutters about government over-reach except in matters that concern them, shows that they have nothing in the tank. Just look at how common core teaches addition to kids and honestly tell me how that is a good way to teach. A simple math problem of 32-12 has about 4 "steps" involved. Such a great metaphor for the govt. Coming this fall to an election near you: Democratic Landslide! Reading energy tomorrow is like the gop indoctrination, pure BS 75% do not want the keystone yo go through, everything they say is total and complete BS, all of it. They talk about infrastructure, as if it were ours, talk about the oil, which isn't ours, we get saddled with ALL the risk, none of the money, none of the oil, no permanent jobs (35), but not once did they mention any of that, its misleading by intent. The truth about keystone makes it another brainer all right, there is simply nothing in it for us but problems, ones that are inevitable, and will cause our eco systems, watersheds, to be destroyed, for their ( Koch brothers) hundred billion dollar profits, enough of the lies, what really is in it for us, seriously, what? He needs to realize something, to many in his own party he matters not. Persona non gratis, would be the secret passwords of the day.